Juliana belonged to the noble Florentine family of Falconieri. Her uncle, Saint Alexis Falconieri, was one of the seven founders of the Servite Order. Through his influence she also consecrated herself from her earliest youth to the religious life and the practices of Christian perfection. After her father's death she received, in about A.D. 1385 from Saint Philip Benitius, then General of the Servites, the habit of the Third Order, of which she became the foundress. Until her mother's death she remained in her parents' house, where she followed the rule given her by Saint Philip Benitius, practicing perfect chastity, strict mortification, severe penance, zealous prayer, and works of Christian charity. After her mother's death she and several companions moved into a house of their own in 1305, which thus became the first convent of the Sisters of the Third Order of Servites; Juliana remaining the superior until the end of her life. Their dress consisted of a black gown, secured by a leather girdle, and a white veil. As the gown had short sleeves to facilitate work, people called the sisters of the new order "Mantellate." They devoted themselves especially to the care of the sick and other works of mercy, and the superioress, through her heroic deeds of charity, set a noble example to all. For 35 years Juliana directed the community of Servite Tertiaries. An extraordinary occurrence, mentioned in the oratio of her feast day, took place at her death. Being unable to receive Holy Communion because of constant vomiting, she requested the priest to spread a corporal upon her breast and lay the Host on it. Shortly afterwards, the Host disappeared and Juliana expired, and the image of a cross, such as had been on the Host, was found on her breast. 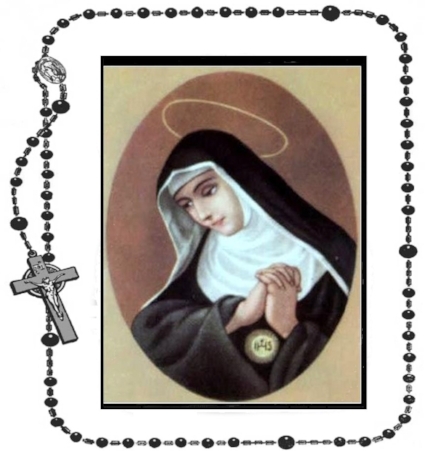 Immediately after her death she was honored as a saint. The Order of Servite Tertiaries was sanctioned by Martin V in 1420. Benedict XIII granted the Servites permission to celebrate the Feast of Saint Juliana. Pope Clement XII canonized her in 1737, and extended the celebration of her feast on June 19 to the entire Church. Saint Juliana is usually represented in the habit of her order with a Host upon her breast.